I often hear this question from parents: “What should my child read?” Sometimes parents are asking for book recommendations, but many times they are expressing some frustration that their kids just don’t enjoy sitting down to read a book. I understand this struggle. I have two very active kids who didn’t like to sit still when they were younger. They considered reading to be a full-contact sport on some days. Sometimes kids just aren’t in the mood for a book – so what’s a parent to do? Kids love humor and they also love to laugh. Try reading the daily or weekly comic section of your newspaper. Whether it’s Peanuts, Baby Blues, Garfield or Calvin & Hobbes, kids will enjoy these short lessons in literacy! Many times, comic strips can teach new words that children may not hear or use in their daily life. Many comics are also written in series (so that the experience you read about in Tuesday’s strip will continue on Wednesday) so kids look forward to reading what will happen in the next installment. Why not begin the day with a little reading?! Many cereal boxes have fun kids games displayed on the back or sides of the box. You can also look at the nutritional values listed and help kids learn about how to choose a healthy cereal. This type of reading is nice because it’s not a page with a lot of words – it’s a fun, colorful box. As kids grow up, they become more interested in what’s going on in the world around them. Many newspapers have some fun sections in addition to the world news (which may or may not be something you want your kids to learn about yet). 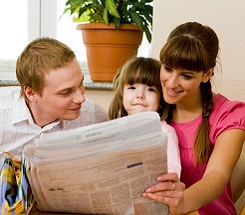 Try the local news, entertainment, science or home & garden sections of your paper for articles of interest to kids. There are many types of things that can be read and they don’t all include words. If you have a child who plays an instrument, they are learning to read a new language. Music is still read from right to left and line by line, so they are practicing similar literacy strategies as they read sheet music. Try to include songs that also have the lyrics listed on the sheet music so kids can practice the words as they are reading the notes. One of my favorite things to encourage kids to read are brochures, booklets and travel guides highlighting our next vacation spot or attractions around town. You can find travel guides and brochures at your local library or order them for free from online travel sites. As a bonus, the kids can learn a little about what it takes to plan a family vacation, too! When a book is just too overwhelming, have kids try reading magazines. There are all types of magazines available for kids – sports, crafts, hobbies, science, history, entertainment, and literary options. Articles are short and can be absorbed in a small amount of time so kids are less likely to feel overwhelmed by having ‘so many pages to read’. Keep a few in the car for some quick & easy reading while you run errands.